A true classic is timeless. 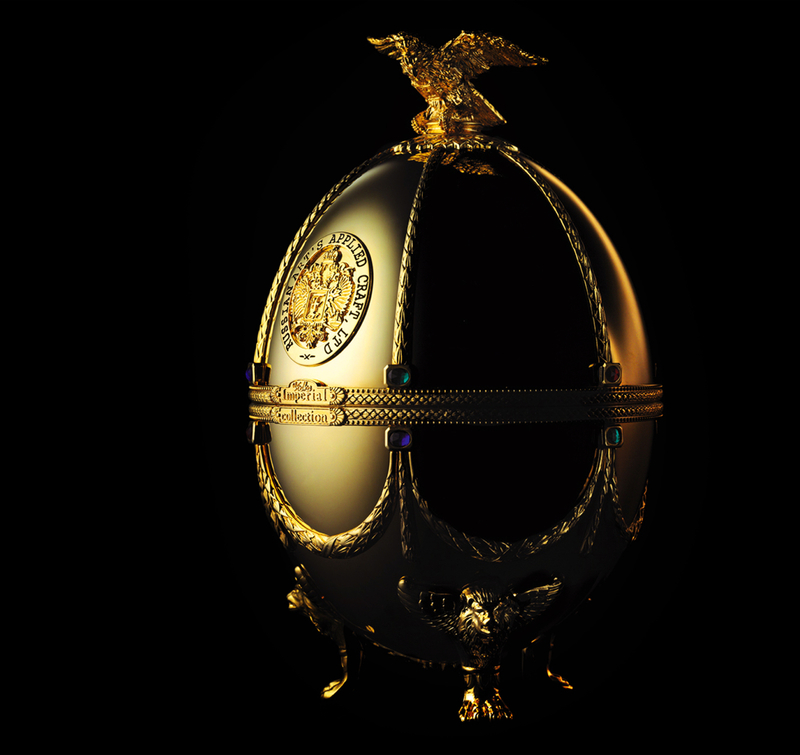 The unique cases in the form of eggs, in style inspired by works of Karl Faberge are true masterpieces of Imperial Collection brand. The case is made of metal alloy, covered with enamel of different colors and decorated with gilded elements and colored crystals. Imperial Collection vodka is a unique product, clean, soft and refined taste of which is created for true connoisseurs. Having united historical traditions of vodka production and exclusive performance, we created not just perfect vodka, but a real masterpiece of handwork. Having created Imperial Collection brand, we united the historical tradition of vodka and cognac jewellery art and modern technologies. Decanters and glasses are made of Venetian glass with elegant gilding. The decanters are made at the old Italian factory founded in the XII century, where the secrets of production of famous Venetian glass are transmitted from one generation to another. The decanter is decorated with pure gold and has a gilded cap with a red Swarovski crystal on top. The composition is completed with an elegant gold eagle, which was designed by one of the most famous Florentine masters, who works in Vatican for over thirty years. All decorative elements are covered in 24-carat gold. The gift set includes a decanter of 70/75 cl with four shots on the arm, a case in form of Faberge Easter Egg, and gift box. To Russians, vodka is an ancient, traditional spirit distilled from the Russian spirit itself. The contents of the carafe – vodka “Imperial collection” has no equal. To prepare the alcohol we take the choicest wheat of the “Saratovskaya” variety. This southern variety has a high starch content and a unique flavor profile. The distillation is done at a distillery which was founded in 1817. This distillery combines classical Russian traditions and the most state-of-the-art ecologically safe technology. Our alcohol is made into vodka in a specialized part of the well-known “Ladoga” factory in St. Petersburg. Water from the Ladoga Lake is famous for its softness and taste. When the vodka is ready, it undergoes a multiple refinement process – firstly passing though highly active birch charcoal, then through a silver filter and finally through a membrane filter, which creates the brilliant sparkle suitable for a vodka bearing the name “Imperial Collection”. Following on in the tradition of Faberge we have created a product, where the form entirely corresponds with the content and for every drop of it we are ready to give our guarantee and say to you, as many years ago the great jeweler said to the Emperor: “YOUR MAJESTY WILL BE PLEASED”. Our Cellar Master selected the eau-de-vie de cognac of the best cru for the real imperial collection creation. He chose the rarity of 1975 from Goulet «paradis» that had reached its height. This multi-dimensional complexity of the collector's millesime has an amber color with bright copper shades, aromas of sandal wood, spices, dried fruits, nuts, licorice, bitter orange, mango and chocolate. The taste is rich, round with tenacious notes of candied fruits. Imperial Collection has won the highest awards at tasting competitions, and is the choice of discerning palates around the world. Ladoga Group was founded in 1995 in Saint Petersburg. The main asset of Ladoga Group is its own factory, which consistently produces high-quality goods. The company has a strongly developed system of distribution to all the regions of the Russian Federation and the geography of export includes over 40 countries.